in these below.... in shared #DANCE spirit! on finding the joy of dance! 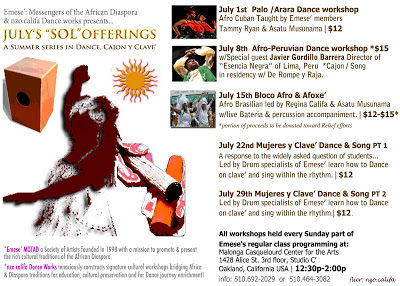 Join us and experience the richness of Latin culture! 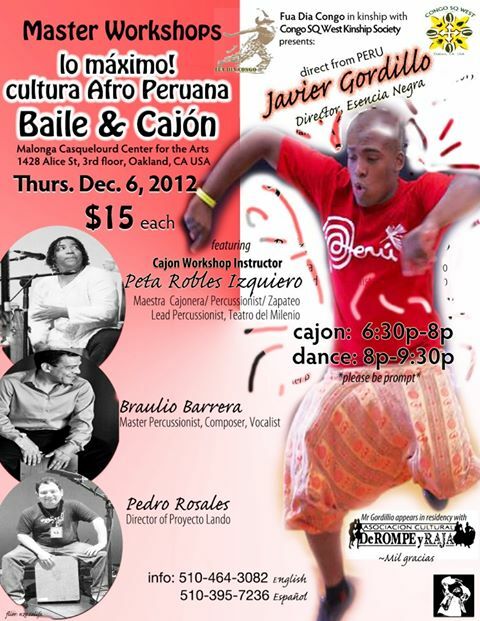 Oakland, CA | Dec. 6th – Thursday! BAY AREA COME OUT & WELCOME THESE ARTISTS! 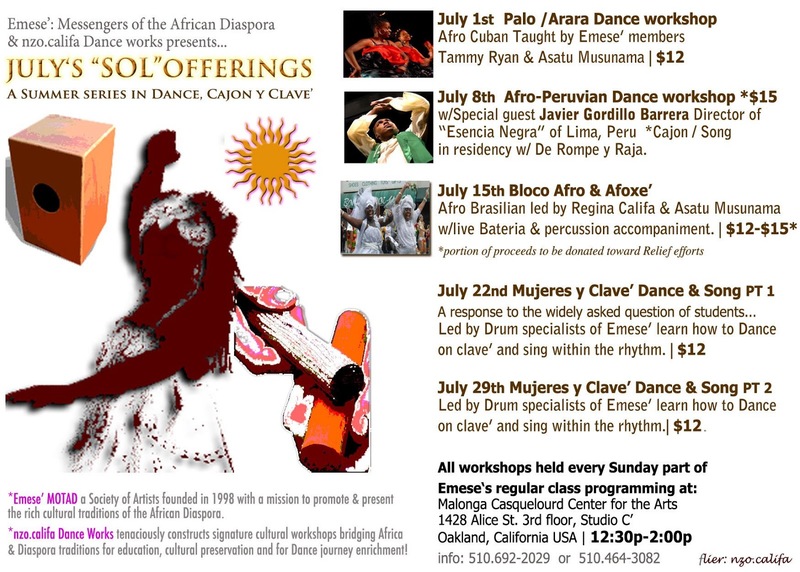 1428 Alice st, 3rd floor Studio "E"
Mil Gracias a De Rompe y Raja Cultural Association. Lo Maximo! 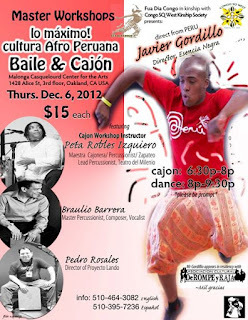 Afro Peruana Baile & Cajon! #Dance-fiyah Special delivery from Lima, PERU ala Dynamo Javier Manuel Gordillo Barrera y @Peta Robles Izquierdo, Cajonera of sweet-thunder! 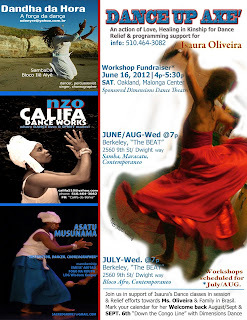 Afro Peruvian Cajon [6:30p] Dance [8p] & ] Master workshops @ The Malonga Casquelourd Center for The Arts. KINship'd by Fua Dia Congo Performing Arts Company Congo SQ West Kinship Society De Rompe y Raja Cultural Association *lo maximo! Honored to hone space 4 Founder/Instructor Elizabeth Soberanes RETURN! with a femme-fierced Bateria, percussionists w/guest leaders to provoke the swingue y sway, to Rock the Malonga, Restore & provide Relief! Join in good Spirit aligned. HOT: Sunday [JUL.15th] my SiSTAR-kin Dandha da Hora* of SambaDA & Ile Aiye joins us as guest Bateria leader, ushering Axe' Ile Aiye grooves! A Grand Salute to You and yours this Summer Solstice Season - and in the midst of your ebbs and flow, I hope that WE Dance - TOGETHER. And with a big smile, I have truly enjoyed stepping UP my DANCE service and share with you the offerings of my next works - it is an exciting season please mark these dates to your dockets. "...where DANCE lives and SPIRIT moves!" & Brasilian Carnaval Dance sensations "Pure Dance Rapture"